Yesterday, Elizabeth Warren introduced the 21st Century Glass-Steagall Act of 2013, co-sponsored by Senators McCain, Cantwell, and King. At today’s Senate Banking Committee hearing, Elizabeth Warren introduced the 21st Century Glass-Steagall Act of 2013, co-sponsored by Senators McCain, Cantwell, and King. This new bill mirrors the original 1933 Glass-Steagall Act, which separated traditional banking activity (like checking and lending) from the riskier activity investment banking (like derivatives). 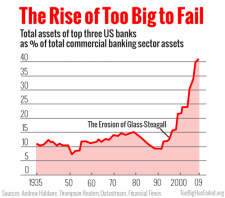 To illustrate, the chart below shows that from 1935 to 1990 the three biggest banks averaged around 10% of total bank assets, but by 2009 they suddenly had over 40%. This new bill from Senator Warren will reverse this trend and make the banks smaller. After all, the three biggest banks (Chase, Bank of America, and Citi) are all bloated conglomerate banks that have enormous traditional and investment subsidiaries, so these banks wouldn’t be able to continue as they’re currently instituted under the new Glass-Steagall Act. Instead these megabanks would be broken up into much smaller firms. What’s more, the new Glass-Steagall Act will make it so banks cannot gamble with derivatives using depositor’s money, as they do today. Currently, depositors at banks like Chase, Bank of America, or Citi implicitly use their money to help these banks make amplified bets that have the potential to cause another global meltdown. Reintroducing Glass-Steagall will make it so depositor’s money cannot be used for the derivatives market. This would be a major step toward restoring sanity to Wall Street.